Statement coats are a game changer in the winter. They’re the backbone in our winter closet. I remember the day I found this coat in TK Maxx, my heart skipped a beat. Ha!! I had been on the hunt for a classic coat like this for ages so there was no two ways about it. -And it was below fifty pounds. Talk of bargain! I’m not a winter person but, having a statement coat like this makes winter worthwhile. 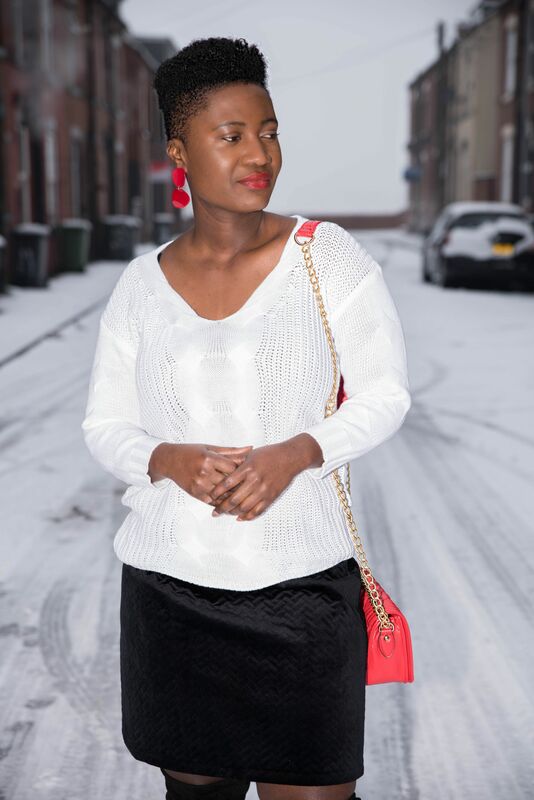 If you’re a friend to this blog, then you know my thoughts about wearing colours in the cold season. Colours have a way of kicking your mood from zero percent to a hundred. It lights a happy sensation and gives you a pep in everything you do. Having a couple of good quality and statement coats goes a long way. It is a good investment because you can get good wears out of them. Please don’t get confused by the word investment here. You can get good coats for few bucks. No need breaking your bank. As a single mother, believe me when I say there’re more important things to invest my money in than spending it on expensive coats. Nope! This Knit V-neck sweater is c/o an online apparel stone called TwinkleDeals (2017 collaboration). It’s light weight but, the quality is wonderful. Aside the arms being a tad short (maybe my arms are too long) on me, I love everything about it. Shipping was super fast and they cater for curvy figured ladies. Bookmark or check them out for affordable things. Teaming the top and coat with this black suede skirt takes the outfit to the classic lane. Above all it is comfortable. The lovely earrings is c/o Zaful. When styling a vibrant statement coat like this, it is all about keeping everything else neutral or simple. The coat is doing the talking without you even trying with the rest of the outfit. That is my take on it. Having said all the above, won’t this coat or outfit be a perfect Valentine’s Day outing look? Your visits and contributions are really appreciated. Lets link up in other social media platforms. This is definitely the perfect coat for a Valentine’s day date. I love the color and how you styled it. I also love the light makeup and the red lips. You look gorgeous! Good to hear that sis. Thanks much!! I’m trying with the makeup. Ha!! I love this coat on You and the color is right up my alley. Enjoy everyday my Dear. Good to hear that Mz Neti! Thanks much dear! The coat is really nice. I love red! But you are so right, making an investment doesn’t mean breaking the bank. It is simply making a wise purchase for something that will last a long time. Have a good weekend Missy May! Exactly my point Madeline. Thanks much and have a lovely weekend too. This red coat is so beautiful! Red looks amazing on you! Girl, I’m loving that colour! It looks like a blood orange one – gorgeous! Wow Missy, this is so perfect combo and suits to you perfectly! Wow I love the mood of this shoot! Red hot! A fabulous red coat is nothing more than spectacular and you wear it so well, Missy!! The red coat is gorgeous! Such a good way to liven an outfit up in Winter! love your vibrant coat against the white pale winter, great choice of color! Gorgeous. Good to hear that Aimee and thanks much. Your jacket looks incredible! I LOVE the colour here, so hot. Que blusa branca e linda o casaco e um arraso. Thanks so much Emily. You’re already there Emily. Good to hear that. This red coat is so pretty! I’ve been wanting to add a red coat to my collection! Or is it more of an orange/red? Hard to tell by the photos! I really love that skirt, too, the texture is nice and it looks soft!! Indeed Carrie! It is a red please and the skirt is soft indeed. Thanks so much. Yes statements coats are so on trend as is red. I so want to get wool coat in a bright or alternative color. In NY everyone wears black so it would be nice to stand out. And love the sweater too! Indeed Alicia! Its always a good idea to stand out. Thanks much beauty! love the coat. it has such a great contrast against the snow! Good to hear that Abi. Thanks so much. You look stunning! I love the bold red color of the coat! Love this red coat on you and how you matched it with red accessories. It’s always nice to add some colors to the winter season. Thanks much Sheryl and couldn’t agree more. What a fortunate find! I must say, TK Maxx is the place to buy exclusive pieces. In my opinion, I feel the snow isn’t off-putting but somewhat delightful as the UK hasn’t experienced snowing like this for years. I couldn’t agree more with you on everything. I love TK Maxx but, it can be a headache shopping there sometimes as you’ve to look and look and look. Lol!! I also trying to wear neutral colors with statement coat or accessories 🙂 love this red look so much! This coat is so chic on you. I completely love how you added that pop of color! Thanks much Camila and good to hear that. Thank you Laura and yes the cold is meannnnnn!! Ha!! That is such a beautiful coat! l’d love a statement red coat like this. I used to have a little red jacket but donated it as I felt I didn’t wear it a lot, and I frequently miss it! one. Good of you to donate your coat. I do that sometimes. Thanks much and wishing you a blessed week. You look gorgeous in this coat , love how you styled it with black and white outfit. Thank you much Nina and good to hear that. Happy new year dearest Lizzy! Oh no sorry to hear that. Its always hard to lose a loved one. Good to hear that things are slowly getting back to normal. Will be waiting patiently for your posts Lizzy. On the topic on colour in winter, I know right!! Tolerable indeed!! I guess red is my favourite colour for a reason. Ha!! you are ROCKING this red look my dear! The red makes such a nice contrast with the snow 😀 Looking good, loving the hair! Couldn’t agree more Yaramel. Thanks much! you’re always on style. i like it. I love statement coats. They definitely brighten up the mood when it’s dull outside. I adore the colour of your coat. I absolutely adore that coat, such a statement in colour and I love what a classic it is! The great thing about TK Maxx is next time you go in there they probably won’t have it so you won’t have swarms of people copying your style! I love it! May have to hunt this bad boy down myself! Good to hear that Jaz. You’re so right about TK Maxx. Ain’t that cool!!? Ha! Thanks so much for the visit. Love the color of this coat. It definitely chases the winter blues away. Your accessories are on point Sis. Agree, this look is perfect for a Valentine’s Day outing. Winter blues sure has no place in the midst of this fabulous styling! Loving the red coat; you look great. The skirt is gorge too. You look BEAUTIFL, MIssy! I love your entire look! Your coat is perfection! Lovely look! im so into red this season that this is a perfect outfit for me! Good to hear Ana and thanks much. I am all fr a bargain when it comes to such outfits!!! Winter coat coats are amazing, even though we don’t have winter in Kenya, I do wear them during the cold season in July. I am all about color as well because it somehow brightens the mod and environment especially during cold days. You look fashionably warm dear! Good to hear that and you’re so right Meron. Thanks much for visiting dear. Oooh, YES. 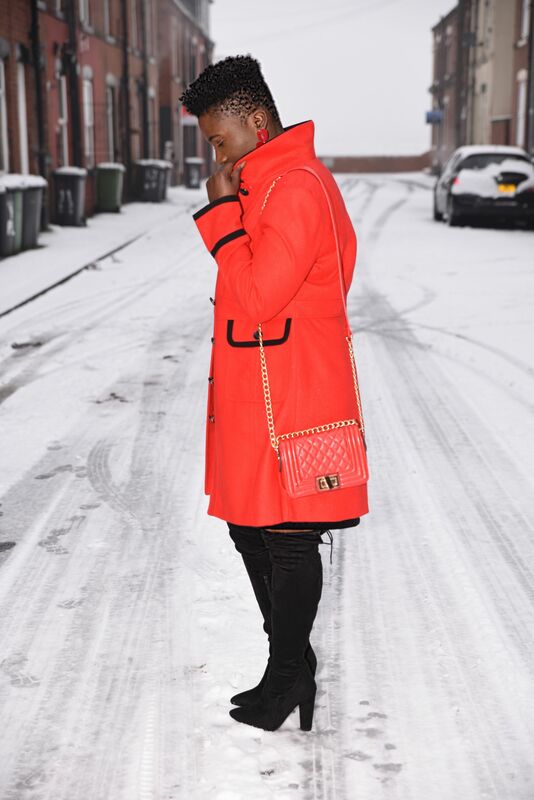 this bright red coat is so pretty- and definitely pops against the snow! The coat is truly amazing! That elegant red coat definitely brightens up a gray winter day! Will gladly lend you Camila. Ha!! Thanks so much. Good to hear that Juliett dear. We hardly have snow too but, I guess the climate has changed. Ha!! I’m a big fan of statement coats. I have to say that you’ve styled this one perfectly. Such a feminine and pretty outfit!